First of all, it is necessary to clear the difference between two principal coffee qualities: Robusta and Arabica. It's a quality that is cultivated at an altitude between 1000 and 2000 metres, where the daylight and relatively cold nights slow down the ripening and produce an aromatic product. 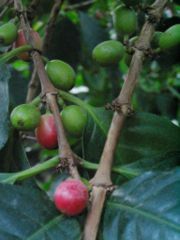 Long and narrow Arabica seeds, which grow in shrubs and bushes, have got a reduced quantity of caffeine and are distinguished by a fruity or floral features. This variety grows in warm and damp plains and its big plants produce small round beans full of caffeine. This coffee has got an intense character and is a full-bodied and bittersweet blend. Countries which are most suitable for growth and development of coffee are concentrated in the tropical area that circles the Earth, between the Tropic of Cancer and the Tropic of Capricorn. Mixing together several types of coffee beans can produce great results. In either case, combined or on their own, the master recipes have been intricately balanced giving the best flavour and aroma, making each and every cup, a unique and memorable experience. Espresso has less than half the caffeine of brewed coffee merely because the amount of time the grounds are in contact with water is shorter.